Pens: Hand cut goose quill with 1mm tip, pointed metal nibs. 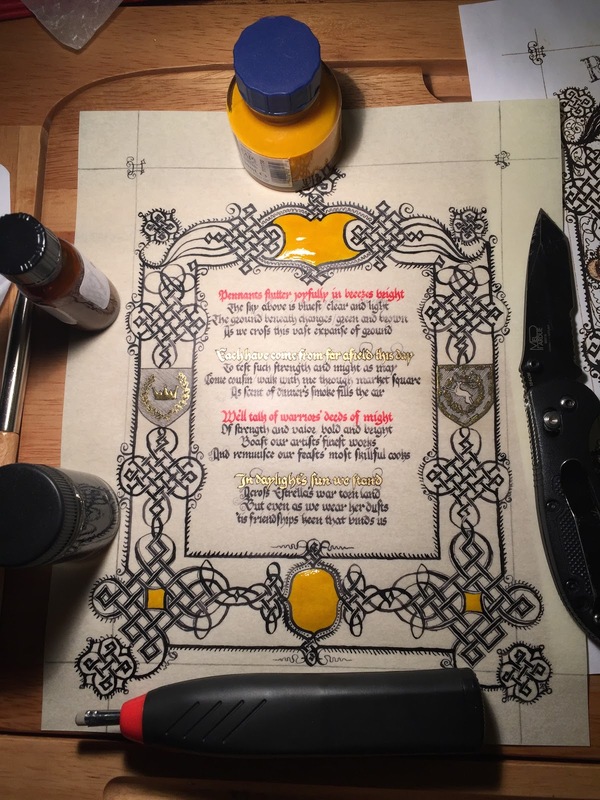 About three months ago I was asked to create a scroll for the East to gift to the Outlands at the Estrella war. I have no idea who it will ultimately be gifted to, but I hope they like it. 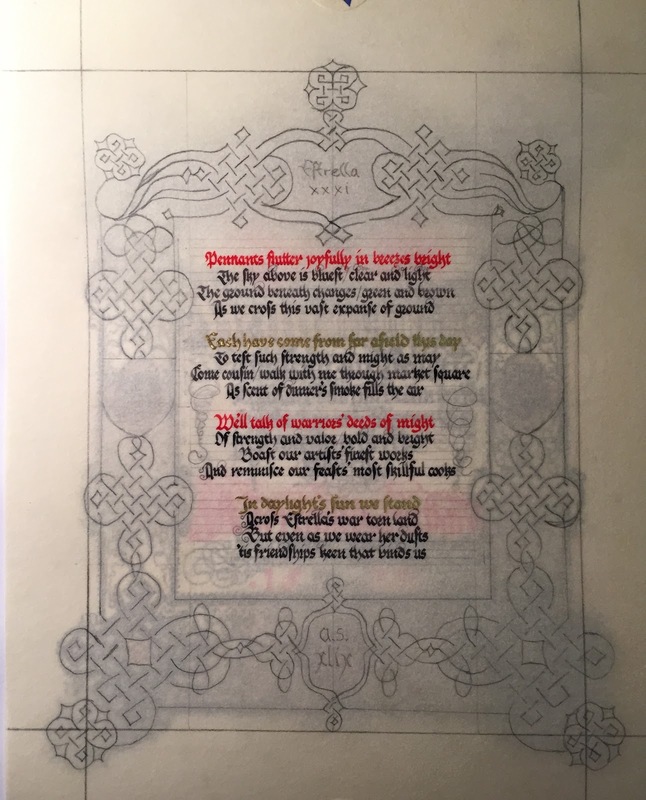 As well as the words by Theodora Bryennissa, I had to include the heraldry of the kingdoms of the East and Outlands, and keep it all within a maximum size of 8 by 10". I had been itching for an excuse to try to copy this particular exemplar since it was first brought to my attention, so off I went. I printed out a copy of the page sized so it matched my 8x10" requirement. Measuring it, I determined I had a space of about 3.5" by 4" to fit the text. I wanted to split the text into four blocks with one line of blank space above each. That meant my lines needed to be about 1/10th of an inch tall. That worked out to a setting of about 6.3 on the 1:1 scale of the AMES guide. 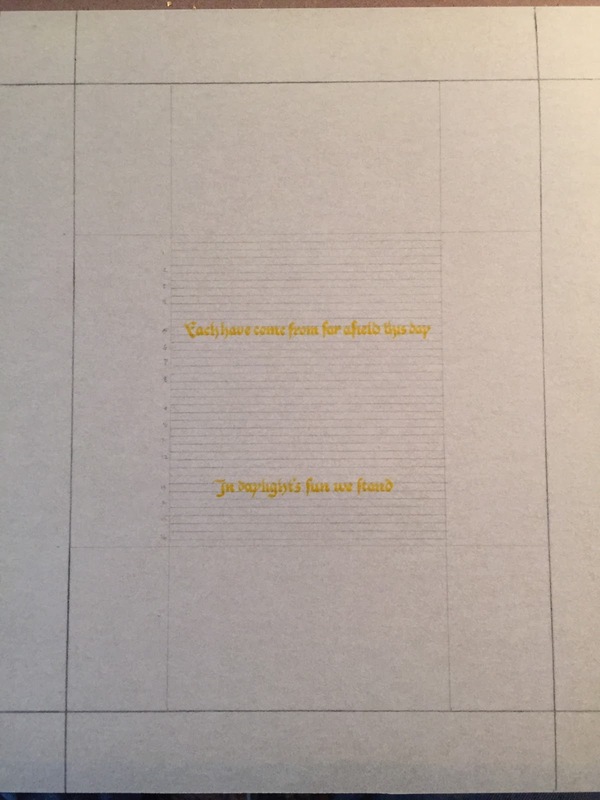 I decided the only way to center the text would be to write it all out once, and use that practice to determine where to place the text on the final page. Here is the poem written out that first time. Happy with my practice on the text, it was time for page prep. First I pounced the page with gum sandarac. Then I drew the 1" margin lines with a lead/tin plummet. 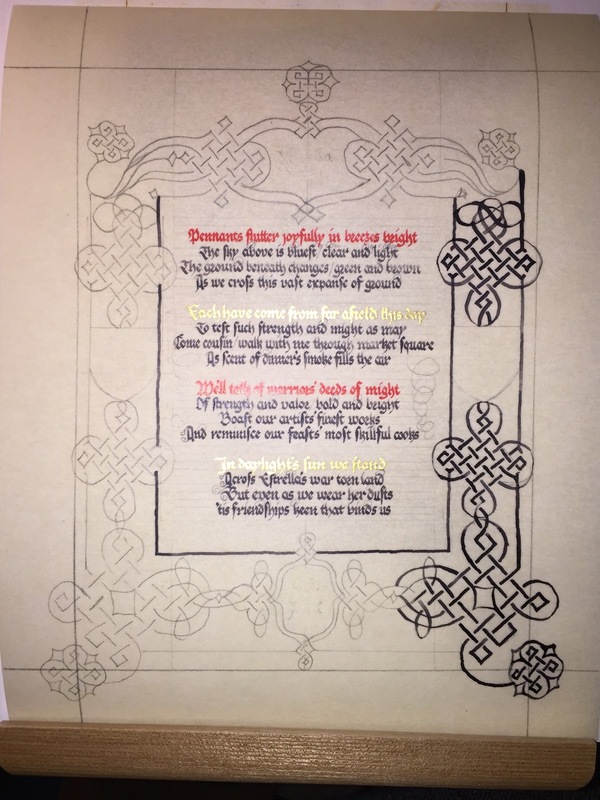 Then I added the pencil lines for the calligraphy. 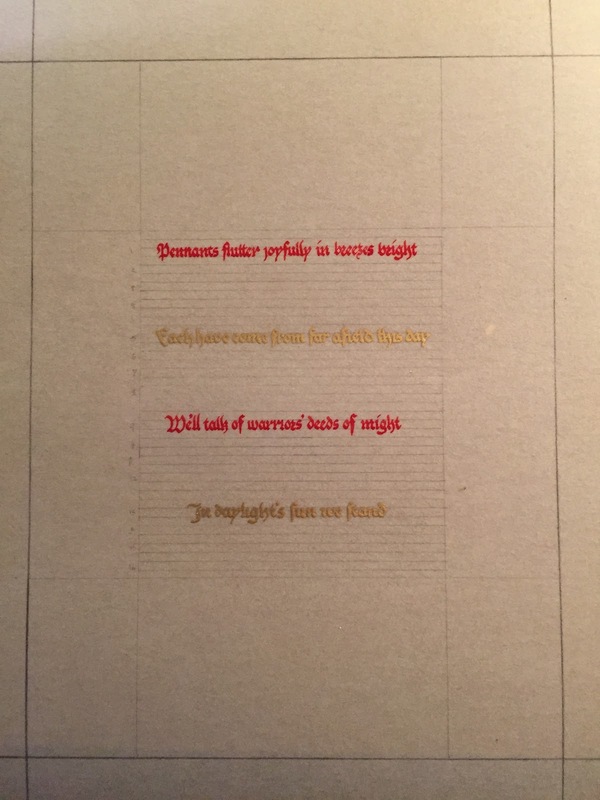 I had decided the first line of each grouping was going to be colored, alternating red and gold. 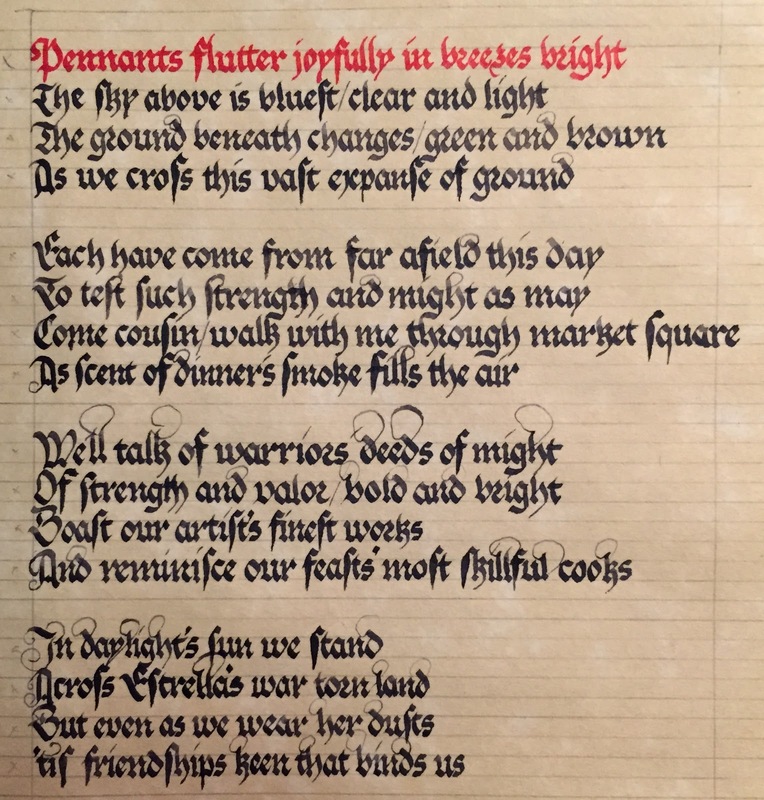 Using some Miniatum Ink, thinned with Winsor & Newton Yellow, I penned the 5th and 13th lines of the poem. After waiting for the ink to dry, I applied the gold leaf. 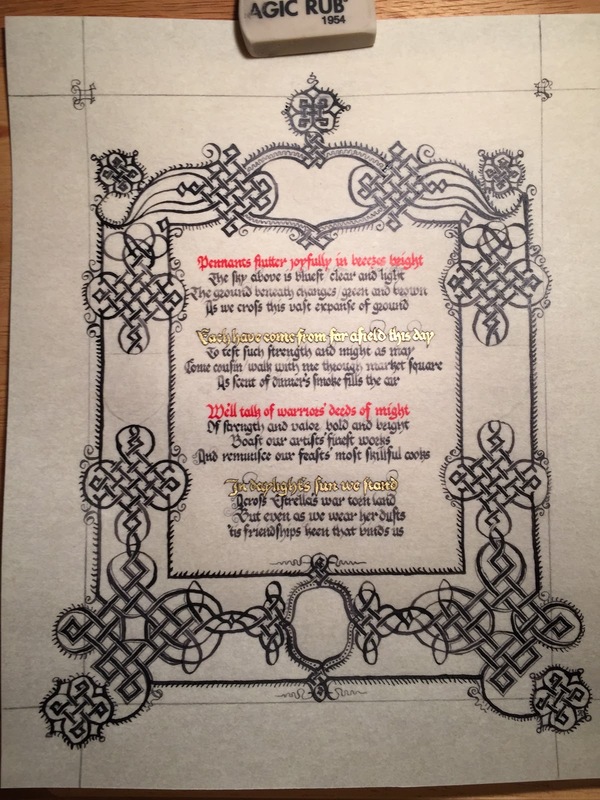 Then I added the 1st and 9th lines in red ink. You might see some evidence if you look closely, but I very nearly had to start over at this step. I penned line 9 in the wrong place! 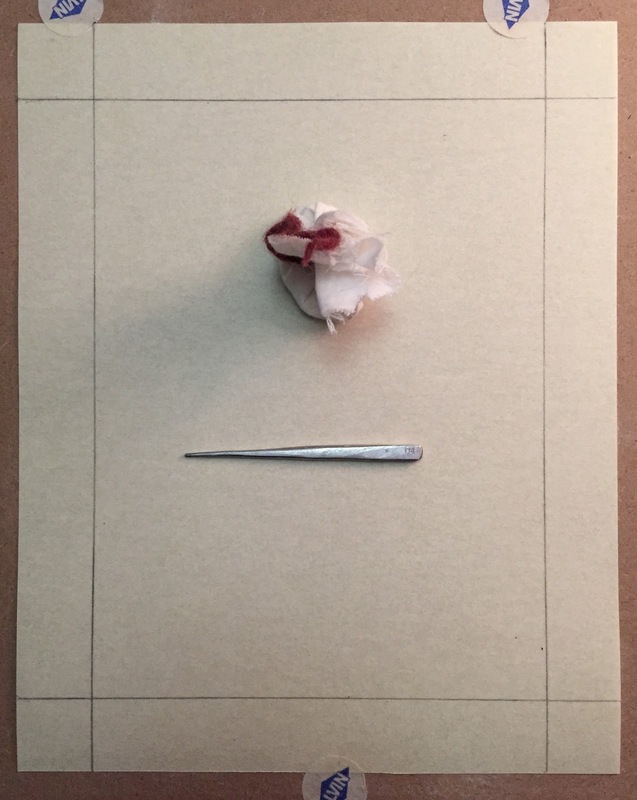 Realizing what I had done, I blotted up the ink with a paper towel, and then erased the area using a piece of nail buffing block that was given to me by Eva Woderose during a class on error correction. This beauty supply item is a soft sponge with a very fine abrasive on the surface. With it, I managed to completely erase the improperly placed line. I pounced again with more gum sandarac, touched up the pencil lines, and added line 9 in the correct place. With the colored text complete, I started adding the black text. 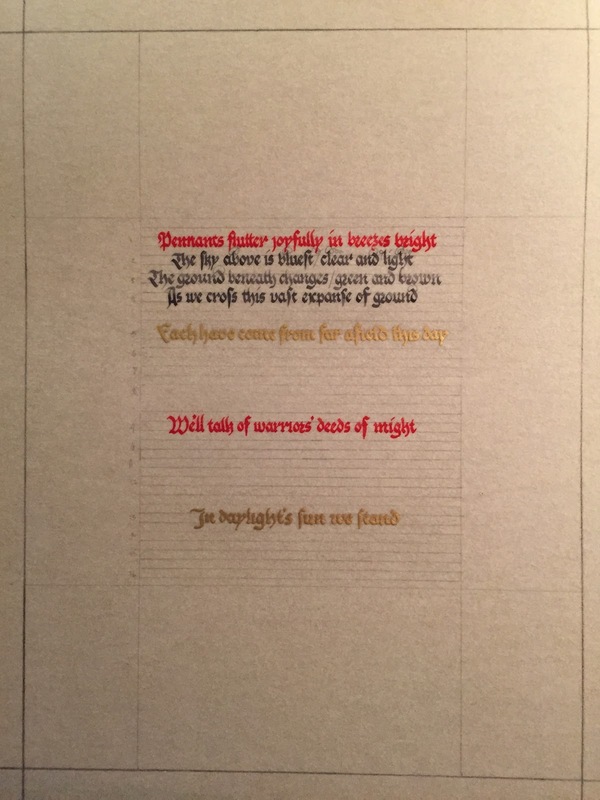 With the text complete, it was time to get to work on the complex border. 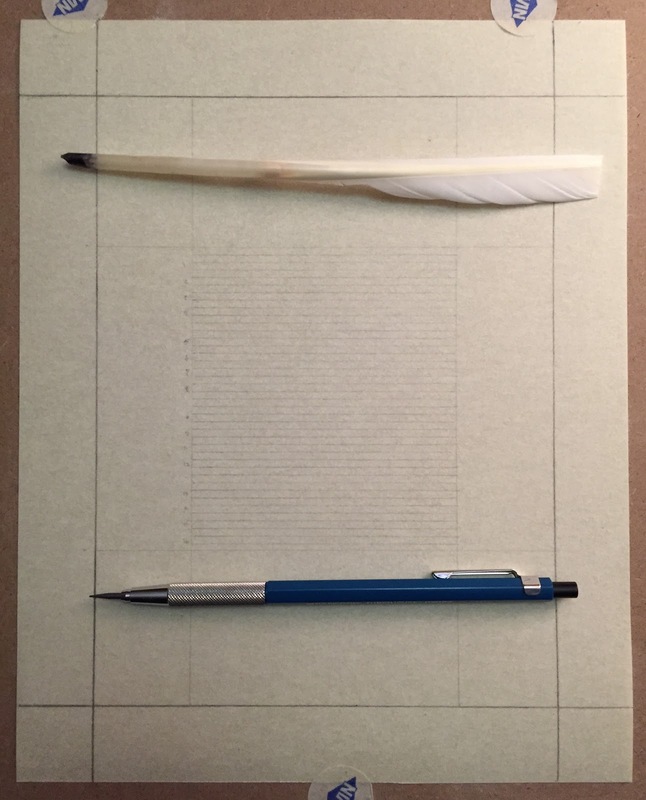 I decided to use a lightbox to pencil in where all the wide pen lines needed to go. I left spaces in the design for the two kingdoms' heraldry. I forgot while doing the design that I couldn't include the year or event number, so you can see them penciled into the design as possible elements. Pencil complete, I started the process of inking all the wide lines. I worked on this for several evenings. 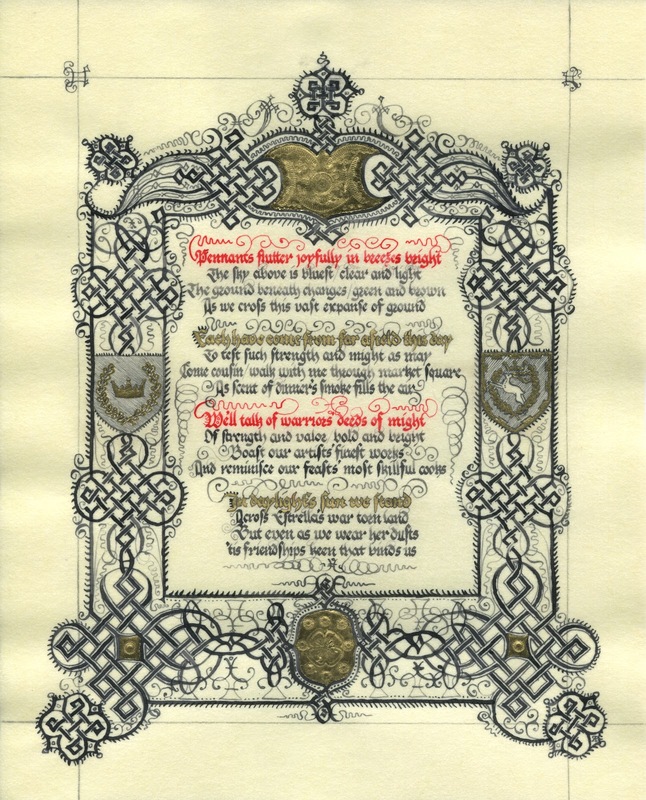 I also outlined the gold text with a pointed nib to help it stand out and match the style of the original. Finally, the wide lines were complete. I switched from my goose quill to a pointed metal nib, and began touching up and adding details. This is when the whole thing really started to come together. Compare the lower right to lower left in the photo below- the fine line work really helps everything pop. 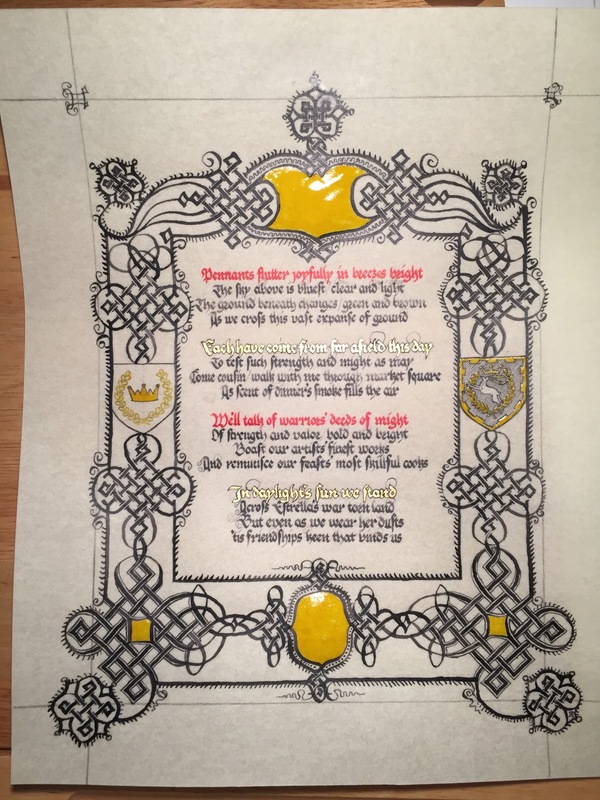 Before I moved on to the pen doodles, I wanted to get the kingdom heraldry and the rest of the gold out of the way. 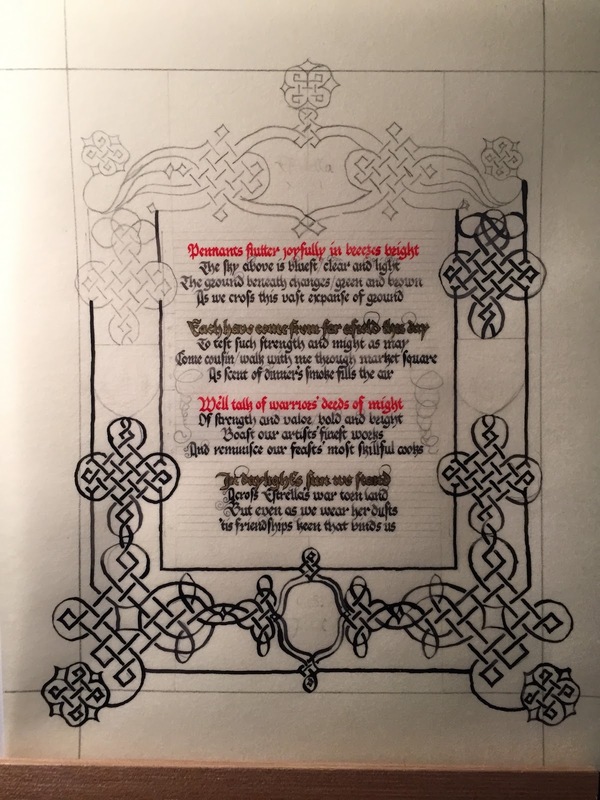 I added the shield outline, sketched and inked in the heraldic designs. To stay with the black & white theme of the original, I decided to only use gold leaf & black ink. Using a pointed nib, I added a set of fine lines to represent the green background of the Outlands' shield. Then I used Miniatum ink for the the wreath, crown and antlers. 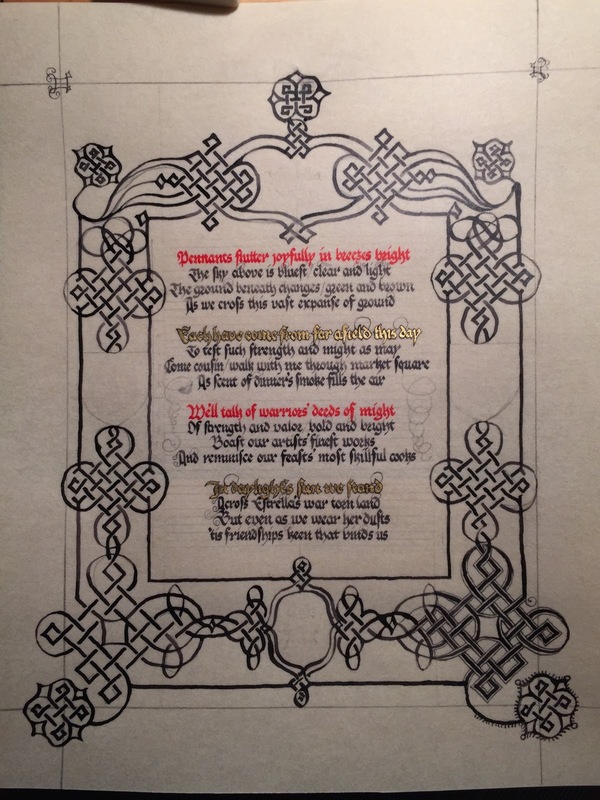 I did the same for the gold outline of the laurel wreathe and the gold crown of the East. While I was using the Miniatum, I filled the remaining areas of the scroll that were going to have gold applied. I added the gold to the shields, as well as the ink background lines on the East's shield to represent the purple background and green wreath. I applied additional coats of Miniatum to the other areas of the scroll. Here you can see me trying to counteract the curl that the scroll started to develop with some weights. 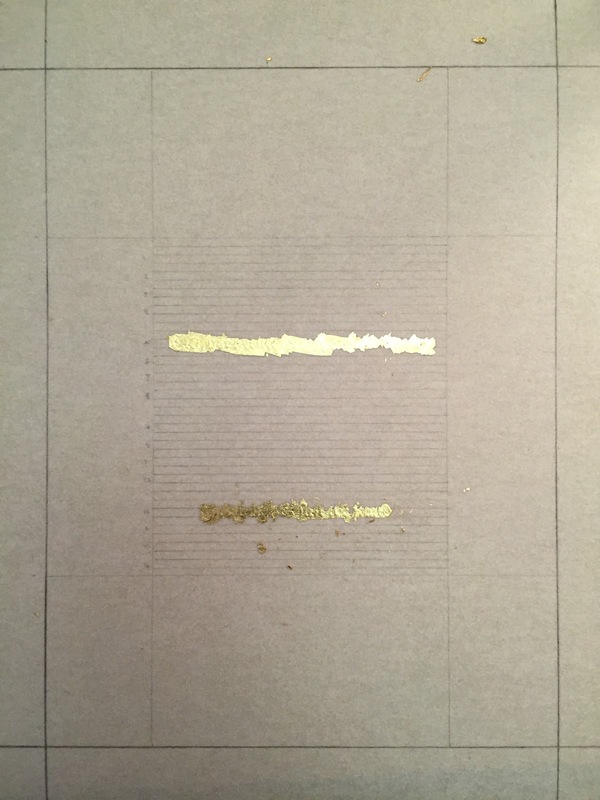 To finish, I applied the rest of the gold leaf. Them I stamped some designs into the gold areas. I placed a piece of scrap leather under the scroll, and then pressed various leatherworking tools into the gold to add the designs. Finally, I used a pointed pen to add all the little space filling doodles. This image is a scan of the finished work, which is why the color is a little different from in the photos.